I love this picture of Nicole - my super intelligent honor student who takes an incredibly heavy load of classes at school. Somehow, in the midst of all of the intensity and seriousness, she manages to have fun. Although admittedly her "fun" looks a bit dangerous. 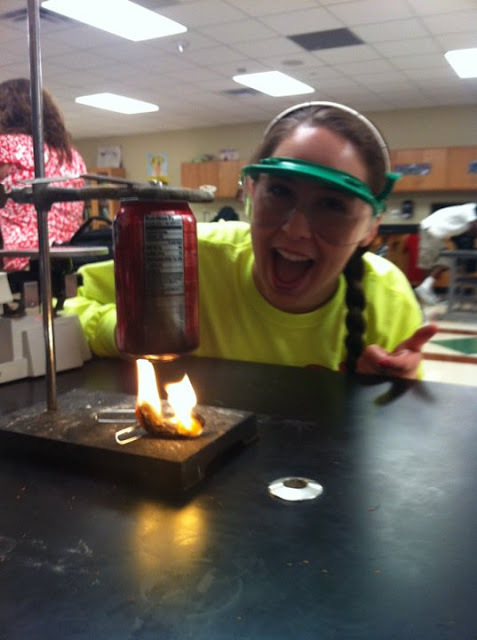 I'm not quite sure what you're supposed to learn from a lab where you light Cheetos on fire underneath a Coca Cola can that seems to be hovering in mid air - but I'm sure that they learned A LOT!!! As her mother, I am ever so grateful she wore her safety goggles! Isn't that the cutest scientist you ever saw??! !